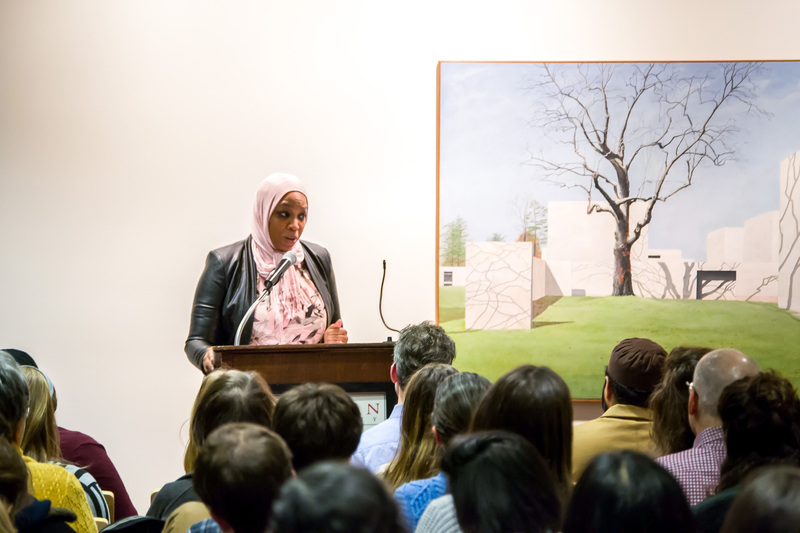 On Feb. 1, University students and faculty, as well as members of the Middletown community, gathered in the Daniel Family Commons for an evening of Muslim and refugee advocacy training. The event came in response to a Jan. 27 executive order, signed by President Donald Trump, stating that visa-holders from seven Muslim-majority countries are barred from entrance into the United States. The primary purpose of the event was to provide information that would allow students to become better allies and advocates for Muslims and refugees affected by the executive order. The speakers included Steve Poellot, legal director of the International Refugee Assistance Project (IRAP), Tahirah Amatul-Wadud, legal counsel for a Muslim congregation in New York and an executive board member for CAIR-Massachusetts, and Imam Sami Aziz, the University’s Muslim chaplain. Due to overwhelming interest in the event, which was hosted by the University’s Refugee Project, the Office of Muslim Life, the Middle Eastern Student Union, and the Allbritton Center, the training was moved from Usdan 110 to the Daniel Family Commons room. A live feed was available on a television for those who could not fit in the room, and many students sat on the floor. After an introduction from the presidents of the University’s Refugee Project and Middle Eastern Student Union, Chaplin Aziz took the podium, greeting the room with the Islamic greeting “Peace be upon you.” He then told the room a story. Chaplin Aziz explained that, as he was on the phone with the officer, even possessing the knowledge that he had not done anything wrong, he asked himself whether he should meet with them. After some deliberation, Aziz decided to agree, knowing that he had nothing to hide. Chaplin Aziz finished his talk with an invitation for students and community members to stand in solidarity with Muslims through kindness and open-mindedness. Next to speak was Poellot, who prefaced his talk with information on IRAP, the organization he works with. According to Poellot, IRAP owes its origins to a group of law students who wanted to make a difference in the refugee crisis, and it has since expanded into a network of 30 chapters in different law schools around the country. “We began representing refugees because there was no one else doing this work. People needed to get that assistance to get to safety,” Poellot said. “Together we represent several hundred clients, some of whom we work with because they worked for the U.S. in Iraq or Afghanistan, and others because they’re just incredibly vulnerable and they need assistance,” he added. Poellot stressed that people who are forced to flee their countries, whether they are being persecuted or not protected by their government, should be welcomed into the United States with open arms. He then provided a legal definition for the phrase “refugee,” as well as information on what the United States has done in the past regarding refugees and how the new Trump administration has changed those precedents. Poellot explained that in U.S. legal terminology, refugees are people fleeing countries due to a well-founded fear that they will be persecuted for a particular characteristic they have, whether nationality, race, religion, membership of a particular social group, or political opinion. Likewise, Poellot explained that refugees, if recognized as asylum-seekers, are legally granted stay in the United States. The process of resettling refugees is pain staking and long, but the United States has the largest formal program in the world, according to Poellot. Refugees, when resettled in the United States, receive some assistance from the U.S. government and end up in communities around the country that provide aid. Poellot added as an aside that people hoping to get involved should look for local organizations that aid resettled refugees and volunteer. Poellot explained that there was a waver in the administration’s stance on admittance of green card holders, and noted that this was evidence of confusion and ongoing change surrounding the order. He added that the U.S. refugee resettlement program has been barred, and the order also bars Syrian refugees from entering the country indefinitely. After Poellot spoke, Wadud took the podium, opening with information on her work as a lawyer and how it has changed over time. Wadud spoke about her experiences as a lawyer, specifically in regard to fighting against prejudice against Muslim Americans. She stressed the importance of communication and collaboration, noting that events like this refugee training were a necessity. After the three speakers spoke, members of the audience asked them a variety of questions, primarily related to ways in which community members and students can take action. All three speakers stressed joining organizations that are working to support and protect Muslims and refugees, as well as simply being an ally in everyday actions. Towards the end of the event, student Melisa Olgun ’20 asked Wadud for advice regarding engaging in internet dialogue, particularly when it comes to being targeted for her advocacy for Muslims online. To this, Wadud received a roomful of applause and laughs. “I’m not just a divorce lawyer now!” she said, riding the wave. This article has been edited to clarify recent developments in the execution of the executive order. Poellot explained that there was a change in the administration’s stance on admittance of green card holders, whom the administration recently announced were not covered by the order, and noted that this was evidence of confusion and ongoing change surrounding the order. He added that the U.S. refugee resettlement program has been suspended, and the order also bars Syrian refugees from entering the country indefinitely.